Sideshows broke out in Oakland Sunday, ahead of the Golden State Warriors final regular season game at Oracle Arena, but no arrests have been reported as yet, according to law enforcement officials. 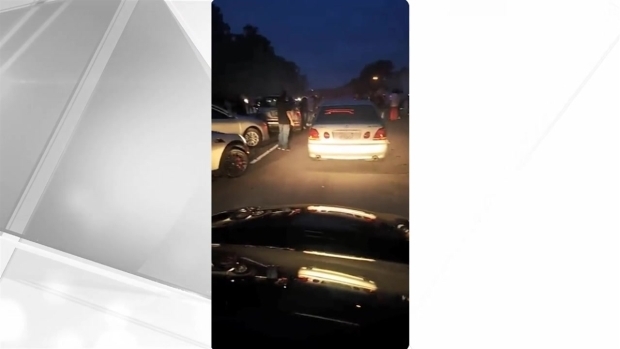 According to the California Highway Patrol, at least two sideshows — displays of cars spinning donuts and skidding around in front of rowdy crowds — erupted Sunday evening. Both sideshows were broken up, with no injuries or arrests reported, law enforcement officials said. According to Oakland police, officers responded to a sideshow around 3:45 p.m. in the 4200 block of International Boulevard. There was a crowd of about 100 people and more than 50 cars with additional motorcycles and dirt bikes. The department requested additional resources, including CHP, CHP Air Support and the Alameda County Sheriff's Office. OPD said that illegal sideshow activity was reported throughout the city at the same time. Officers continued to respond to the other locations as well as priority calls where police services were needed. It was approximately two hours before officers were able to clear the area. The California Highway Patrol broke up a sideshow that blocked traffic on westbound Interstate Highway 580 near the 106th Avenue overcrossing. CHP Officer Herman Baza said that blockage was reported about 7:50 p.m. Sunday, and that it continued for about 20 minutes before being broken up. "They were hitting donuts. People about getting hit with cars. Looked like a couple hundred people wilding out," said sideshow witness Sky Clay. Video of that gathering, with three vehicles spinning their tires, making smoke and sliding around, was posted on Twitter. "It's dangerous for the people participating in their vehicles, it’s dangerous for the spectators outside the vehicles and also extremely dangerous for other motorists who aren’t expecting the freeway to be shut down in front of them," said CHP spokesperson John Fransen. At least two "sideshows," displays of cars spinning donuts and skidding around in front of rowdy crowds, were broken up in Oakland on Sunday, with no injuries or arrests reported, law enforcement officials said. As sideshow season kicks in, the police and the CHP are looking for new ways to curb the problem. Last month Contra Costa County installed circular speed markers at a sideshow hot spot. While the big sideshow events have quelled, the reckless drivers have managed to tear out some of the bumps, and neighbors say they still see one or two drivers spinning out daily. As the spin outs continue, frustration has shifted into high gear. "It's ridiculous, it’s hell because you’re just trying to mind your business and get on the freeway or come up the street because I had one person trying to get to me and they said they were stuck there for an hour trying to get past — they couldn’t do anything," Clay said.